Field grown cut flower production is on the rise. Annuals are relatively easy and inexpensive to grow and there is a wide selection of heights, colors and cultivars from which to choose. Most annuals have a long season of bloom. The greatest disadvantages are that annuals have to be planted every year and their ease of production can cause a "glut" on the market. To extend production during the season, growers should consider regulating the sowing and planting dates and choose appropriate cultivars. To choose the most successful cut flowers for your business consider your general growing conditions, technical capabilities, and your market. Growing conditions may include the number of frost-free days in your area, your soil type, and sun exposure. 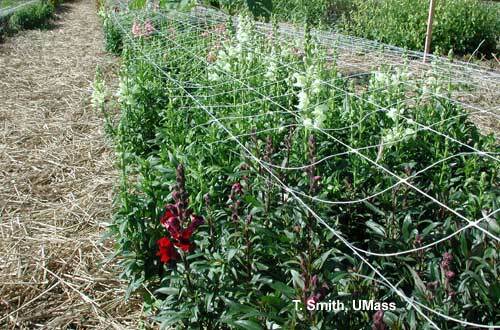 Growers in Massachusetts have approximately 120 frost free days. Some plants can be direct-sown in the field while others must be started in plug trays and transplanted. When deciding whether or not to direct-seed, consider the price of seed as well as the number of days from seeding to flower. You'll notice that some hybrid seed is very expensive and as a result you will want to use transplants. Crops will also vary depending on whether you sell direct to consumer, to retailers or to wholesalers. Contact local wholesalers and florists for valuable suggestions and ideas about what plant material the market wants, when it wants it, how much it wants, and what kind of price to expect. The following is a list of some common annuals that can be grown for cut flowers. Some annuals such as asters and zinnias have many cultivars from which to choose. AGERATUM (Ageratum houstonianum). 'Blue Horizon'. Seed sources: Park, Sakata. Flowers measure more than 3" across and are borne on strong stems, 30" tall with an 8" spread. 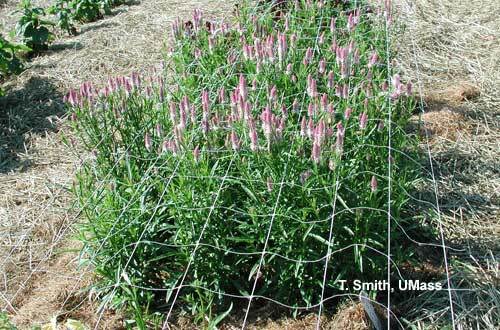 Plants will flower 13-15 weeks from seeding or 5-7 weeks from 8 week old plants. Space plants approximately 6x6" and plan to use a layer of support wire. Cut ageratum offers a nice moderate sized blue flower for the florist trade. SNAPDRAGON (Antirrhinum majus). 'Rocket' series. Seed sources: Harris Moran, Vaughan's, Park, Stokes. This tall hybrid series was developed especially for outdoor growing. Plants average 36" in height. 'Sonnet' Mix. Seed sources: Harris Moran, Vaughan's, Park. The main spike is surrounded by numerous small branches which flower shortly after the center spike. Stems are very sturdy and average 18" in height. Snapdragons can be spaced 8x8". Allow 13-15 weeks from seed to flower. With the expense of hybrid seed, you might not want to sow directly into the field. A disadvantage to field grown snaps is that after bees pollinate the flowers, the florets drop off, but snaps are still a good crop for use in summer bouquets. LACE FLOWER (Ammi majus). Seed sources: Park, Burpee. Free-flowering plants bear white flower heads, 5-6" across on 3' stems. Each flower resembles a tiny snowflake. An excellent, easy-to-grow alternative to Baby's Breath for cutting. Be aware that Lace Flower is very slow to germinate (15-20 days). Flowers from seed planted in Mid-May should be ready to cut by mid-July. ASTER (Callistephus chinensis). 'Serene' series. Seed sources: Park, Sakata. Blue, red, rose or formula mix. Flowers measure 2" in diameter, on 27" strong stems. All branches produce flowers at the same time, providing whole-plant bouquets. Plants will flower just 14 weeks from sowing. Space plants 12x12". These spray-type asters have beautiful flowers that should be in high demand at florists. COCKSCOMB (Celosia argentea). 'Century' series. Seed sources: Harris Moran, Stokes. Red, yellow, flame or rose colored feathery plumes on 27" stems. Approximately 50 days from seed to flower. Final spacing should be 10x10" or 12x12" apart. Plants produce many side-shoots, which make this series excellent for cuts. 'Sparkler' series. Seed sources: Sakata, Stokes. Plumes colored carmine, cream, orange, red, yellow and a mix are produced on plants 30" tall. Space young plants 12x12" apart to produce seven or eight stems per plant. 'Toreador'. Seed Sources: Harris Moran, Park, Stokes. Very tall, bright red cristata type cockscombs are produced on 24" stems. Plants are easy to grow and these fresh flowers could provide a niche market. MARIGOLD (Tagetes erecta). 'Jubilee' series. Seed sources: Harris Moran, Parks, Stokes, Vaughan's. Flowers are 4" in diameter and plants get about 24" tall. These are hedge type plants that are strongly resistant to wind and rain, and flowers are long-lasting. 'Crackerjack'. Seed sources: Harris Moran, Stokes, Park. This is an early blooming cultivar bearing 5" double flowers on 30" bushy plants. Marigolds can be spaced 12x12" apart. The distinctive odor of marigold leaves may concern some customers, but leaves can be removed to eliminate the source of the fragrance. PINCUSHION FLOWER (Scabiosa stellata). 'Blue Moon'. Seed source: Thompson and Morgan. Lavender blue flowers on stems 36" tall. Long-lasting cut flower. Allow 12 weeks from seed to flower. 'Imperial Giants Mixture'. Seed source: Harris Moran. This cultivar grows on stems 24"-30" tall and makes an excellent cut flower. Flower colors include pink, white, salmon, scarlet, deep red, lavender and blue. Plan to space scabiosa 12x24". ZINNIA (Zinnia elegans). 'Sunrise' series. Seed source: Park. A cut-and-come again variety with long, strong stems that is long lasting as a cut flower. Flowers are 3.5" pompon-type blooms on 2.5' stems. Allow 60 days from seed to flower. 'Gold Sun', 'Red Sun'. Seed sources: Stokes, Vaughans. These are early flowering dahlia types that bloom 60-70 days from seed. Space plants 2' between rows and 6" in the row for best branching and harvesting. Double blooms average 4" across on 20" stems. In general, tall large-flowered types with blooms more than 4" in diameter and stems up to 3' are preferred as cut flowers. A Note on Spacing: Narrow spacing suppresses side branching and results in flowers for single harvest. On the other hand wide spacing works well for multiple harvests. Spacing recommendations in this article are for multiple harvests and should be used as a guideline. Your experience will dictate spacings for your particular situation in future years. BACHELOR'S BUTTON (Centaurea cyanus) can be sown directly into the field this fall. Centaurea will germinate and produce small plants a few weeks from seeding. Cover these plants with straw for winter protection. Plants will flower in late May. Suggested cultivars include: 'Blue Boy' (about 3' tall) and 'Pinkie'. LARKSPUR (Delphinium elatum) can also be grown in a similar manner. Seed beds should be covered with straw following sowing but the seed won't germinate until early spring. You should be able to begin cutting flowers in mid-June. A good, double-flowered strain is the 'Regal' series. In summary, these are just a few of the many annuals and varieties from which to choose. There are also many other annuals that can be grown for cut flowers. Calendula, Helianthus, Lathyrus, Chrysanthemum, Cosmos, Gypsophila, Gomphrena, Statice, Flowering Cabbage and Kale, and Lisianthus are also worthy crops. The key to success is to disregard preconceived ideas and allow yourself to think about new and different crops and how you can market them. Growers should plan to try a couple of different cut flowers each year and follow their production characteristics and marketing potential to enable them to remain competitive in the marketplace. Anonymous. 1988. What's new in cut flowers. GrowerTalks Oct. 1988. pp 46-58. Armitage, A.M. 1987. Annuals as cut flowers Presented at the National Conference on Field Grown Cut Flowers, 28-29 May 1987. Auman, C.W. 1980. Minor cut crops. Chapt. 7. In R.A. Larson (ed.). Introduction to floriculture. Acad. Press, Inc., New York, N.Y.
Nau, J. 1991. Seven bedding plants you can ring up as cuts. GrowerTalks 54(9):93-106. Seals, J. 1987. Some uncommon and common (But choice) cut flowers from seed for field growing. Presented at the National Conference on Field Grown Cut Flowers, 28-29 May 1987. Seals, J. 1987. Factors in selecting crops for cut flowers. Presented at the National Conference on Field Grown Cut Flowers, 28-29 May 1987. Sommer, C. 1984. Producing cut flowers outdoors for added profits. Florists' Review 174(4496), 2 Feb. 1984. Utami, L. and R. Anderson. 1990. Field grown cut flowers in Kentucky. Greenhouse Grower's News 6(3):4-8.